WHICH phase of our freedom struggle won for us Independence? Mahatma Gandhi’s 1942 Quit India movement or The INA army launched by Netaji Bose to free India or the Royal Indian Navy Mutiny of 1946? According to the British Prime Minister Clement Attlee, during whose regime India became free, it was the INA and the RIN Mutiny of February 18-23 1946 that made the British realise that their time was up in India. An extract from a letter written by P.V. 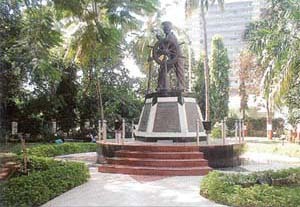 Chuckraborty, former Chief Justice of Calcutta High Court, on March 30 1976, reads thus: "When I was acting as Governor of West Bengal in 1956, Lord Clement Attlee, who as the British Prime Minister in post war years was responsible for India’s freedom, visited India and stayed in Raj Bhavan Calcutta for two days`85 I put it straight to him like this: ‘The Quit India Movement of Gandhi practically died out long before 1947 and there was nothing in the Indian situation at that time, which made it necessary for the British to leave India in a hurry. Why then did they do so?’ In reply Attlee cited several reasons, the most important of which were the INA activities of Netaji Subhas Chandra Bose, which weakened the very foundation of the British Empire in India, and the RIN Mutiny which made the British realise that the Indian armed forces could no longer be trusted to prop up the British. When asked about the extent to which the British decision to quit India was influenced by Mahatma Gandhi’s 1942 movement, Attlee’s lips widened in smile of disdain and he uttered, slowly, ‘Minimal’." Strangely enough, like the chapattis which went all around India during the 1857 First War of Independence asking the nation drive away the British, it was 20 loaves of bread that started this so-called RIN Mutiny. It was a reaction against the high-handed behaviour by British officers of the RIN. On January 16, 1946, a contingent of 67 ratings of various branches arrived at Castle Barracks, Mint Road, in Fort Mumbai. This contingent had arrived from the basic training establishment, HMIS Akbar, located at Thane a suburb of Mumbai at four in the evening. The officer on duty informed the galley (kitchen) staff of this arrival. Quite casually, the duty cook, without winking an eyelid, took out 20 loaves of bread from the large cupboard and added three litres of tap water to the mutton curry as well as the gram dal which was lying already cooked before as per the morning strength of the ratings. On that day, only 17 ratings ate the watery, tasteless meals, while the rest went ashore and ate. When reported to senior officers present, this grievances practically evoked no response and the discontentment continued to build up. These complaints continued to agitate the ratings and a naval central strike committee was formed on February 18, 1946. It was led by naval rating M.S Khan. Soon, thousands of disgruntled ratings from Mumbai, Karachi, Cochin and Vishakhapatnam joined them. They communicated with each other through the wireless communication sets available in HMIS Talwar. Thus, the entire revolt was coordinated. The unrest spread to shore establishments from the initial flashpoint in Bombay to Karachi and Calcutta, involving 78 ships, 20 shore establishments and 20,000 sailors. The next morning, the Tricolour was hoisted by the ratings on most of the ships and establishments. The third day came charged with fresh emotions. Sardar Patel’s statement of assurance did improve matters considerably. However, an unruly guncrew of a 25-pounder gun fitted in an old ship, fired a salvo, without orders from the strikers, towards the Castle barracks and blew off a large branch of an old banyan tree. By this time the British destroyers fully armed to go into action arrived and had positioned themselves off the Gateway of India in Mumbai. The RIN Mutiny was treated as a crisis of the empire by an alarmed British cabinet and Attlee Clement, ordered the Royal Navy to put down the revolt. Admiral Godfrey, the Flag Officer commanding the RIN, went on air with his order "Submit or perish". The next day, the RAF (Royal Air Force) threatened the defiant RIN ships by flying a squadron of bombers low over Bombay harbour even as Admiral Rattray, Flag Officer, Bombay, RIN, issued an ultimatum asking the ratings to raise black flags and surrender unconditionally. Both Muhammad Ali Jinnah and Sardar Patel successfully persuaded the ratings to surrender. Patel wrote, "Discipline in the army cannot be tampered with. We will want [the] army even in free India". Mahatma Gandhi, criticised the strikers for mutinying without the call of a ‘prepared revolutionary party’ and without the ‘guidance and intervention’ of ‘political leaders of their choice’. The issue remained unresolved till the morning of February 23, when the hopeless situation produced a vote of surrender. The black flags went up at six on the morning of February 23. The negotiations moved fast, keeping in view the extreme sensitivity of the situation and most of the demands of the strikers regarding welfare measures were conceded in principle. Immediate steps were taken to improve the quality of food served in the ratings’ kitchen and their living conditions. But these were followed up by court martials and large-scale dismissals from the service. None of those dismissed were reinstated into either of the Indian or Pakistani navies after Independence. But the brave sailors had demonstrated to the British that they would rise in defence of their motherland, thus leaving the foreign imperialists little option but to quit.